We pick out some potential NFL cap cuts. 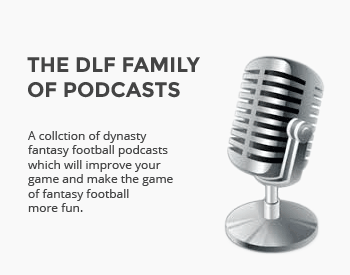 Who could help your dynasty teams? The fantasy season has come to an end. It is difficult to fully acknowledge this but we must look ahead and start making plans to improve our dynasty teams building championship contenders. The good news is there is no off-season for dynasty leaguers. The next few months will be filled with the NFL Combine, free agency, the NFL Draft and more. All of these events will greatly affect player value and dynasty strategy. In this Off-Season Primer series, I’ll make sure you and your dynasty teams are ready for all that might happen in the coming months by giving you an advance look at players who could be on the move. Anytime I have a question regarding a player’s contract or team salary cap situation, I visit Spotrac, which includes all of the information you could ever need regarding the financial side of the NFL, along with financial information for all other major sports as well. Here at DLF, we think so much of this site that we’ve included some of their graphics on each of our player pages. March will bring both free agency, along with teams naming their franchise and transition tag players, but even before these events, teams will begin preparing for the 2019 season by making some difficult decisions. Among these decisions will be cutting players, primarily due to their impending contract responsibilities. Spotrac.com recently released an article listing players who could be victims of these “cap cuts.” I strongly suggest you read Potential 2019 NFL Roster Bubbles by Michael Ginnitti, but for now, I’ll share some of the highlights, along with the potential dynasty fantasy football impact. After yet another season stuck as a game-managing quarterback, former first-round pick quarterback Ryan Tannehill is reportedly in danger of being cut by the Dolphins. Prior to Week 17, local beat writers reported that the team was ready to move on from their long-time starter. With a new coaching staff set to take over and nearly $19 million in total savings, Tannehill will almost certainly be looking for work. The Dolphins have no in-house options to claim the starting job but could use their eleventh overall pick on a rookie or sign one of the many signal callers expected to be available in free agency. This writing has been on the wall since the 2018 NFL Draft when the Ravens used a first-round pick on quarterback Lamar Jackson. When veteran starter Joe Flacco went out of the lineup in mid-season with a hip injury, he likely had no idea that all but signaled the end of his tenure with Baltimore. The Ravens will reportedly look to trade Flacco before simply cutting him and considering the annual quarterback shortage, they will find a partner. Good article and great point to start assessing teams (most of my teams are in a dead time where there is no FA and roster moves are entirely locked. I’d be surprised if the Bucs come out and cut Brate immediately, and would not be surprised to see them hold on a another year. Between Howard’s inherent durability issues, and it being “last call” for Jameis Winston, I’m guessing Arians wants to give him as many opportunities and weapons as possible. This could change if DJax is convinced to come back another year (please god no). If I’m Jerry-World, I’m watching Crabtree very closely. He’s not your #1 but you’re also not asking him to be. He has done well in a complementary role (opposite in fact of the current #1 WR in Dallas) and does a lot of his work on shorter passes freeing Amari up deep. Above all else, at least he’s an upgrade over Cole Beasley, more durable than Allen Hurns and helps take pressure off Gallup. Guessing he can be had at or around the $5M saved on Hurns to boot. Are you sure Lamar Miller can be cut with savings? Looks like it’s a full cap hit if he’s cut? I’ll definitely double check that one. Thanks for the heads up. Easily the most useful DLF piece of the new off season for me. Thank you!